There is so much buzz around big data. We all need to know what it is and how it works - that much is obvious. But is a basic understanding of the theory enough to hold your own in strategy meetings? Probably. But what will set you apart from the rest is actually knowing how to USE big data to get solid, real-world business results - and putting that in place to improve performance. Big Data will give you a clear understanding, blueprint, and step-by-step approach to building your own big data strategy. This is a well-needed practical introduction to actually putting the topic into practice. 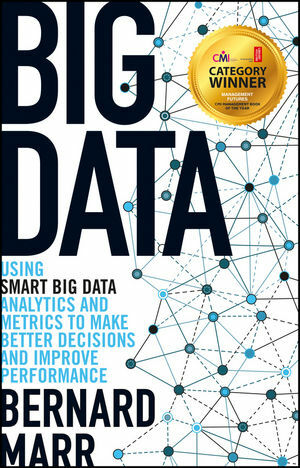 Illustrated with numerous real-world examples from a cross section of companies and organisations, Big Data will take you through the five steps of the SMART model: Start with Strategy, Measure Metrics and Data, Apply Analytics, Report Results, Transform. BERNARD MARR  the 'Big Data Guru'  is one of the world's most highly respected voices anywhere when it comes to data in business. In Big Data, you have access to techniques for converting raw information into real business results. Marr brings complex concepts down to earth, so you can use data the SMART way to transform everything you do.